Oklahoma’s number one offense versus LSU’s number one defense. Bob Stoops versus Nick Saban. Controversially selection of two 12-1 teams. The result? The Sooners’ Heisman Trophy-winning QB Jason White completed 13 of 37 passes for just 102 yards with 2 INT’s and 7 sacks. LSU freshman running back Justin Vincent rushed for 117 yards and a TD, leading the Tigers to their first National Championship since 1958. The only BCS title game decided by a last second field goal featured Auburn’s Heisman Trophy winning QB Cam Newton and the high flying Duck offense lead by tailback LaMichael James. Much more of a defensive struggles than just about everyone expected, Oregon scored a touchdown and 2 point conversion with 2:33 remaining in the fourth quarter to tie the game at 19. That’s when the future number one NFL draft pick calmly led his team down the field to set up Wes Byrum’s 19-yard game-winning field goal as time expired. While Auburn entered the game a 10 ½ point underdog, War Eagle jumped to a 21-3 lead against a Seminole team that hadn’t won a game all season by less than 2 touchdowns. But Jimbo Fischer’s call for a fake punt near the end of the first half led to FSU’s first TD and put the top ranked team in the position to make a run. However, a Seminole FG comprised the entire scoring for the third quarter, leaving FSU at a 21-13 fourth quarter deficit. An 11 yard TD pass from Heisman Trophy winning quarterback Jameis Winston, who had been having his worst game of the year, brought State to within one. Auburn rallied behind star running back Tre Mason but had to settle for a 22 yard FG. Nine seconds later though, FSU took its first lead since up 3-0 early in the first quarter when freshman Levonte Whitfield went 100 yards on the ensuing kickoff. Still kicking, Mason completed a three minute drive and put Auburn up 31 to 27 on a 37-yard run. But 1:11 was all Winston needed to bring Seminole Nation its first title since 1999 when he hit Kelvin Benjamin in the end zone from the 2 yard line with 13 tics left on the clock. 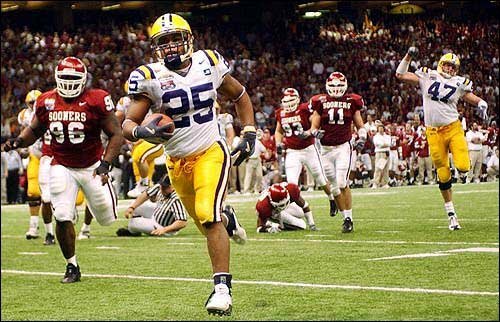 The only overtime game in BCS title game history took 2 OTs to crown a champion. Ohio State entered the game a 14-point dog against a Miami team filled with future NFL talent including Willis McGahee, Andre Johnson, Kellen Winlsow Jr., Sean Taylor, Rashad Butler, Vince Wilfork, D. J. Williams, William Joseph, Jerome McDougle, Antrel Rolle, Kelly Jennings, Ken Dorsey and Jonathan Vilma. Ohio State featured quarterback Craig Krenzel, freshman phenom Maurice Clarett at running back and three-time All-American defensive back Mike Doss. The fourth-down pass-interference call against Miami in the first overtime that allowed Ohio State to score and send the game into the second overtime is probably the most controversial call in BCS history if not in football. Clarett’s five-yard TD run put OSU ahead by in the second OT and the Buckeye’s defense held Miami after a 1st and goal from the 2-yard line to clinch the victory. On rare occasions, big games exceed the hype. This was one such game with USC ranked number 1 and Texas number 2 throughout the season. Having played each other on only four previous occasions, the last in 1967, the BCS finally got one right by providing a matchup of two undefeated, traditional powerhouses with big name players on each side. USC was riding a 34 game win streak and defending its’03 and ’04 National Titles with the first college football team to feature two Heisman Trophy winners in the same starting lineup, quarterback Matt Leinart and running back Reggie Bush. UT countered with Heisman finalist Vince Young, who had dominated the Rose Bowl one year earlier. USC struck first to take a 7-0 first quarter lead over the jittery Horns which finally got on the board following Michael Huff’s recovery of Bush’s ill-advised lateral after a 35 yard catch and run. Texas’ Michael Griffin then made a sensational interception of a Leinart pass in the end zone setting up UT at the Trojan 20. Using his legs and arm, Young moved the Longhorns 80 yards to take their first lead of the day, 9-7. Texas scored again following a short punt and a Ramonce Taylor 30 yard run with 2:34 left in the half. USC countered with a last second FG concluding the first half with Texas leading 16 to 10. Southern Cal came out strong in the third behind Leinart’s arm and LenDale White’s legs to take a 17 -16 lead. The Longhorns quickly responded as Young scored the first of his three rushing TD’s to retake the lead 23-17. But White’s third rushing touchdown, a 12-yard run on 4th and 1, put USC up 24-23 going into the fourth. The Trojans opened the fourth with a nine play, 80-yard drive capped by Reggie Bush’s only TD of the game, a 26-yard run. UT followed with its own 9 play drive but settled for a 34-yard FG. SC’s subsequent 4 play, 80-yard TD drive provided the defending champions its largest lead of the game, 38 to 26 with 6:42 remaining. Not yet finished, Young accounted for all the Longhorns’ yards on their ensuing touchdown drive, 25 yards on the ground and 44 in the air, which put Texas within five with 3:58 left to play. Looking to wear down the clock, SC gained a first down but soon faced 4th and 2 near midfield when LenDale White’s fumble was recovered by wide receiver Steve Smith two yards shy of a first down. Weary of Young’s ability to move down the field, Trojan coach Pete Carroll stuck with his offense and elected to go for the first down instead of punting. For the first time all game, Texas’ defense stopped White, allowing Young and company one last opportunity from its own 44-yard line with 2:09 to play. The Horn’s overcame a third down and twelve, before two complete passes moved the ball to USC’s 14-yard line. The Trojan’s stiffened, however, and forced the Horns into a fourth and 5 from the 9-yard line. Young lined up in the shotgun but with no open receivers, bolted towards the right sideline where Justin Blalock provided a critical block as Young won the footrace to the corner of the end zone for the go ahead score with 19 seconds left on the clock. A two-point conversion provided the final margin of victory, 41 to 38. The two teams combined for 1130 total yards. Vince Young was 30 for 40 with 267 yards and 19 carries for another 200. Four players in the game became top ten picks in the 2006 NFL Draft: Reggie Bush (2nd overall, New Orleans), Vince Young (3rd overall, Tennessee), Michael Huff (7th overall, Oakland), and Matt Leinart (10th overall, Arizona). Taitusi Lutui, Fred Matua, LenDale White, David Kirtmen, Winston Justice, Cedric Griffin, David Thomas, Frostee Rucker, Dominique Byrd, Darnell Bing, Jonathan Scott, LaJuan Ramsey, and Rodrique Wright were drafted in the next six rounds. This was the last game of longtime ABC Sports announcer Keith Jackson.